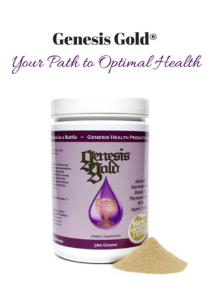 Can Genesis Gold® replace the rest of my supplements? Before Genesis Gold® most of my patients were spending hundreds of dollars per month on supplements, trying to treat all their symptoms, never getting to the root of their issue. So I researched what was the root of all the hormonal issues, the neurological imbalances, the immune dysfunction I was seeing in patients who were traveling from all around the world for my help. That’s when I found the maestro of the body’s biochemical symphony is your Hypothalamus. And then I researched what I could feed your hypothalamus to get it back in balance, to correct the biochemical miscommunication, to help your body heal at the genetic level. Then I created it – Genesis Gold®! Just one delicious green drink of Genesis Gold® once a day replaces dozens of pills and saves $200-300 every month on more complicated regimens.